Medical scheduling software is a specific type of software that automates the patient scheduling process for medical offices by providing a tool to coordinate provider calendars and patient requests for appointments, and confirm available time slots. There are several components and features standard among office scheduling software solutions. When assessing a system, providers should look for the following. The bridge between patient and provider scheduling is a critical function, which allows both staff and patients to schedule only during available blocks of time and avoid conflicts. Tracking technology allows providers to follow patients throughout their office visit – from the point of check-in through the time they leave the practice. Organized systems, such as color-coding, allow providers to track patients, physicians, and appointment status, including changes and cancellations. An automated phone call and text service that eliminates the time spent dialing and messaging patients. Appointment reminders have proven effective in reducing no-shows. An intuitive interface allows practices to organize and simplify scheduling. User-friendly functionality enables staff to create patients easily in the system and automatically scan for available appointments. An important component of scheduling software, mobile access ensures providers can access the software anywhere and also allows them to receive updates on schedule changes and notifications on their mobile devices. The patient portal is the access point of the scheduling system for patients. This “self-service” webpage allows patients to enter and manage appointments. Patient portals also provide patients with access to lab results, medical imaging and other important information. Many solutions have the ability to match patients with qualified providers based on diagnostic and treatment types. This capability saves time and helps to align patient needs with the clinician best-suited to address their specific situation, which in turn helps ensure quality care outcomes. A valuable benefit and common component of scheduling software is the ability to reach and mobilize providers; dispatching them to specific locations for appointments or emergencies. As with any healthcare process or program, both the selection of the system and the implementation phases are critical to ensuring the effectiveness of the initiative. In order to determine which medical appointment scheduling solution to implement, practices should first establish a budget for the software. For example, defining what is financially feasible will help providers decide between a full suite of integrated modules and a standalone system; the latter of which is generally more cost-effective. Another important consideration for cost-conscious practices is a software as a service (SaaS) solution. SaaS solutions are web-based and easier to operate and maintain due to the fact that the software is hosted offsite and vendor-supported. For practices that need to access the system from multiple locations, including remote or “satellite” offices, hospitals and providers’ homes, web-based solutions are often preferable as they can be easily implemented and are capable of easily sharing data. Healthcare scheduling software can provide practices with a number of key benefits. Outlined below are some of the advantages providers can expect upon implementing a medical scheduling solution. Intuitive, easy-to-use tools and features such as appointment search match patient requests with providers’ calendars, resulting in a significant time savings. An online staff portal also saves patients time – they no longer have to call and coordinate appointments with office staff. Without the burden of scheduling, staff can focus on more important tasks and functions. 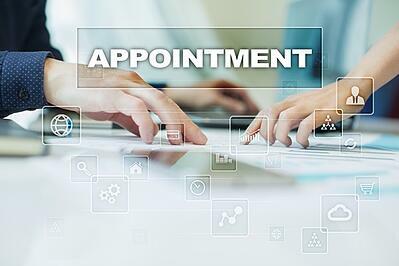 The appointment reminder function common in most medical scheduling systems is effective in helping patients keep their appointments, and has proven to reduce no-shows by as much as 40% in some cases. Scheduling software can significantly reduce wait times as it eliminates the need for patients to wait in a queue in order to see a provider. Medical scheduling software provides a cost-effective, all-in-one solution that eliminates the need for costly servers, networking and software. It can also eliminate the need for staff members to work overtime – scheduling patients and managing provider schedules. The ability to centralize patient information from the first encounter, while collecting demographic information, medical history, and payment information is a key benefit to providers. Payer information can also be easily updated when changes occur in patients' insurance or coverage. Scheduling software also provides a means of maintaining schedules across multiple offices and for various providers. Naturally, a more efficient and streamlined appointment scheduling process means fewer steps and less hassle for patients, which in turn positively impacts patient satisfaction. Medical scheduling software eliminates many of the issues that often generate complaints among patients when scheduling appointments, such as hold times and the need for multiple office calls to confirm an appointment time that is mutually agreeable for both patient and provider. Delays in sending and receiving information can be costly for both patients and medical offices. Medical receptionist software offers real-time updates on co-pays, as well as cancellations and schedule changes, to ensure that all parties are working with current information. Web-based solutions allow providers to check their schedules at home, on the road, anywhere. Staff have access to the schedule and its features regardless of whether they are in the office or working remotely from another setting. Offices benefit from the ability to tailor the solution to their unique needs by customizing appointment settings based on the provider, time allotted to appointments, and the reason for the appointment. Most solutions also provide offices with the ability to create custom labels, forms and patient letters. If regularly monitored by staff, medical scheduling software can enable providers to offer same-day appointments, which could positively impact patient satisfaction and allow offices to maintain a full schedule and ensure no opportunities for additional revenue are lost. As with any process or solution, a number of potential barriers exist in effectively adopting medical scheduling software. Outlined below are some key issues providers should anticipate and work to address proactively. - Some practices are reluctant to adopt scheduling software because it means abandoning trusted systems on which they have relied for years. The transition can be especially challenging for some offices because workflows and processes are rooted in these legacy systems. While medical scheduling software has the potential to produce long-term savings, it does require an initial investment to implement a new system and train staff. In some cases, transitioning to medical scheduling software is cost prohibitive for some practices due to limited funds or budgetary challenges. While automated appointment systems offer a host of benefits, they lack the flexibility and critical thinking required to address complex cases or those that are not pre-defined in the software. This is an area in which proponents of traditional scheduling methods are often critical of medical scheduling software, arguing that a lack of human intuition and historical knowledge can create challenges in scheduling. It is difficult to triage patients who have made appointments through medical scheduling software. As a result, patients may use the system to schedule appointments for conditions or issues that are more urgent in nature and should be addressed immediately in an emergency room or urgent care setting. An example can be found in patients who book appointment slots, but either cancel or “no-show.” In these instances, the provider’s limited time is wasted and a slot is lost, which could have otherwise been filled by another patient. Just as some providers and offices may be reluctant to embrace new scheduling technology, so too are some patients. Those who are not tech savvy or simply prefer not to utilize technology may be dissatisfied, or at the very least, reluctant to use the system. While some patients and providers may be slow to adopt and embrace medical scheduling software, overall there is a growing trend of practices shifting to the technology and the results provide a compelling case for transitioning to an automated system. As outlined above, there are clear benefits to transitioning to medical scheduling software. Upon implementing an automated solution, providers can expect to benefit from cost savings, added efficiencies, reduced wait times, fewer no-shows, an improved patient experience and more. At RevenueXL, we simplify scheduling with proven solutions, such as our PrognoCIS Medical Practice Management Software. PrognoCIS includes best-in-class scheduling features and an intuitive, user-friendly interface thoughtfully designed specifically for today’s busy provider. Anytime/anywhere access, advanced customization, powerful organizational tools and more– PrognoCIS is your solution for automated scheduling that links not only patients and providers, but also links your practice to more efficient processes and improved patient satisfaction. Sound like the right fit for your office? Contact us today to learn what the RevenueXL difference can mean for you.